Gorgonians, elegant Sea Fans and Sea whips adorn reef landscapes all around the world! Gorgonians inhabit many areas of the ocean, but they have the greatest diversity in tropical and subtropical waters. There are over 1200 known species of Gorgonians. They are also commonly known as horn corals or horny corals. Gorgonians come in a great variety of shapes from flattened and branching fan-like forms to whip-like, feathery, and pinnate. A pinnate Gorgonian is one where its branches interconnect into a mesh. 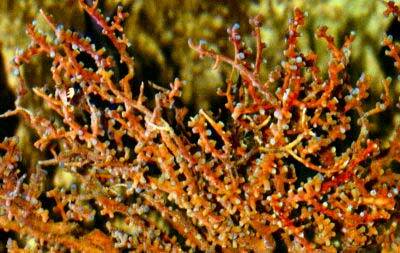 The distinctive forms of the Gorgonians include the beautiful sea fan and the dynamic sea whip. They can also be bushy, creating a soft sea spray similar to the Sea Pens in the order Pennatulacea. Most are very colorful in shades of yellow, orange, and red. The Alcyonacea order consists of hundreds of animals. It is divided into several families and suborders that include not only the Soft Corals and Leather Corals, but also the Gorgonians. Many other unique Octocorals include the Sea Pens, Blue Coral, and Mat Polyps like the Organ Pipe Coral and Green Star Polyps. Gorgonians can thrive for a long time if provided with the proper environment in the reef aquarium. However, they are considered a more difficult coral to care for. They need to be attached to the substrate and most require a brisk but moderate water movement. Most gorgonians are photosynthetic and so need light to survive, but the species that are found at great depths or in shaded areas, don't require light. They must usually be fed to survive in the aquarium. There are many different species, and many of them are not easy keepers. Be sure to learn about the type of Gorgonian you wish to keep to have a successful experience. The Encrusting Gorgonian, while sometimes having a blue to green cast, is typically cream or light brown. They area easy to care for and will spread onto any surface they come in contact with. They do well with most water movement and do need light to survive and will grow quicker in strong lighting and feeding. They do not need to be fed if there are fish in the tank. Position them away from other corals, as they will overgrow them. This video shows an amazing grouping of Red Gorgonians in the wild. The polyps need to be fed so often that the water quality of the tank will suffer. Once they loose 10% of their polyps, death is imminent. These are best left in the ocean, since they are quickly overgrown by algae even in the best aquariums. What are Gorgonians? Gorgonians are Cnidarians, which means stinging celled animals. They belong to the Order Alcyonacea, and then are further divided into three Suborders: Holaxonia, Scleraxonia, and Calcaxonia. They are also members of the Subclass Octocorallia, known as the Octocorals. These are corals that generally have eight-fold symmetry or eight-branched tentacles in their polyp structure. There are over 1200 known species of Gorgonians. They are found primarily in the Caribbean, but a few species are also found in the Indo-Pacific. Gorgonians inhabit many areas of the ocean, but they have the greatest diversity in tropical and subtropical waters. Most are found from coastal waters to depths of 985 feet (300 m), with very few species in deeper seas. The tropical Gorgonians were introduced into the saltwater aquarium trade in 1970, and specimens from the Caribbean were introduced in the 1980's. They are also known as Horn Corals or Horny Corals. The distinctive forms of the Gorgonians include the beautiful sea fan, a dynamic sea whip, or they can be bushy creating a soft sea spray. Most Gorgonians are very colorful found in shades of yellow, orange, and red. The color can be permanent in those of the suborder Scleraxonia that incorporate pigmented sclerites within their structure. Gorgonian Identification Gorgonians come in a great variety of shapes from flattened and branching fan-like forms to whip-like, feathery, and pinnate. Pinnate is where two branches interconnect into a mesh. They are often described as a sea fan or a sea whip. They can also be bushy resembling a sea spray, similar to the Sea Pens in the order Pennatulacea. Like the Soft Corals, the Gorgonians are colonial sessile animals. They form colonies that are generally erect, but can be encrusting. Their variety of shapes ranges anywhere from flattened and branching fan-like forms to whip-like, feathery, and pinnate forms. Gorgonians have a tough, yet very flexible central axial rod that is covered with a living surface called a rind. The axial skeleton of those in the suborder Holaxonia is composed of a fibrous protein substance, known as gorgonin. It is similar to the horn material of mammals. Thus the common names, Gorgonian, Horn Coral or Horny Coral, are derived from this substance. Those in the suborder Scleraxonia are calcium based like other Octocorals. Their central stem attaches to the substrate, with delicate branches radiating outward. They not only attach themselves to hard surfaces, but also are also capable of anchoring to soft bottoms with root-like runners. Most are very colorful in shades of yellow, orange, and red. The color can be permanent in those of the suborder Scleraxonia that incorporate pigmented sclerites within their structure. There is a broad spectrum of shapes, but all Gorgonians have the same morphology. Their surface, the rind, is covered with small polyps. There can be two types of polyps, the autozooids and the siphonozooids. The polyps known as autozooids have eight pinnate tentacles and eight septae. Their role is to acquire food for the colony. The tentacles capture the prey, primarily planktonic foods from the water column, and move it to the mouth in the center. The eight septae are equal sized compartments with interconnecting channels that distribute the food throughout the colony. The second type of polyp is known as siphonozooids. It has reduced tentacles and cilia, along with an oral cavity. Its job is to pump water into the body of the colony, which supplies oxygen and also helps so keep the soft coral erect. Types of Gorgonians In their taxonomical structure, the Gorgonians belong to the Order Alcyonacea, which also consists of the soft corals. This order, along with numerous others, is a member of the Subclass Octocorallia, known as the Octocorals. These are corals with eight-branched tentacles and eight septae in their polyp structure. Under the Alcyonacea order the Gorgonians are further divided into three Suborders, Holaxonia, Scleraxonia, and Calcaxonia. The systematic classification of members of the Subclass Octocorallia is highly complex. It contains quite a diverse group, and like most corals they are considered poorly understood and understudied. The current taxonomy is under constant flux, for example the Gorgonians have been moved between Suborders. So it is to be expected that classifications will continue to change. In fact many experts are in favor of a complete revision. Different sources may show some categorization differences. This group was described by Studer in 1887. The axial skeleton of Gorgonians in the suborder Holaxonia is composed of a fibrous protein substance, known as gorgonin. It is similar to the horn material of mammals. Thus the common names, Gorgonian, Horn Coral or Horny Coral, are derived from this substance. This group was described by Studer in 1887. The axial skeleton of Gorgonians in the suborder Scleraxonia are calcium based like other Octocorals. They have sclerites that are fused, or mostly fused, in their axis, their rind, and sometimes in their polyps. Bushy Sea Rod Rumphella sp. Gorgonian Care Though considered more difficult to care for, Gorgonians can thrive for a long time if provided with the proper environment. All Gorgonians must be anchored to the substrate and they need a brisk but moderate water movement. This helps rid them of a waxy film that is secreted, and also to rid them of algae. Surge devices or turbulent water flow is best. Since they are photosynthetic, they need good lighting as well as strong currents. Although most are not accustomed to the very strong lights produced by metal halide, it is said that they will eventually adjust and grow faster because of it. Some can be fed while others cannot. In either case photosynthetic gorgonians don't need to be fed in order to survive. For those that need to be fed, feed them at least once a week. Feed detritus, brine shrimp, Daphnia, Cyclops, or pulverized flake food, shrimp or clams. Sometimes you can stir up the gravel slightly in order to mix detritus in the water for feeding the detritus eating species. All Octocorals produce toxins, and these toxins can be released to ward off competition for space. Excellent filtration with foam fractionators (protein skimmers) along with activated carbon can help to remove and control some of the toxin. But Gorgonians are best kept in a tank dedicated to softies, or with a very minimal mix with other corals, depending on the type and space available. Feeding Gorgonians Like other Octocorals, Gorgonians obtain their nutrition from multiple sources in the wild. Many receive most of their nutrients through a symbiotic relationship with marine algae, known as zooxanthellae. They also capture planktonic organisms and microscopic food particles from the water column and can absorb dissolved organic matter. Those that are photosynthetic need light to survive. Others, like the finger corals, grow at great depths or shaded areas and don't require light. They usually must be fed to survive in the aquarium. In captivity, those that are capable of metabolizing foodstuffs will grow faster when they receive regular meals, targeted with a feeding tube. These species will usually accept small foods like brine shrimp, Cyclop-eeze, fish eggs, and plankton. They will benefit from occasionally soaking food in vitamins as well. On most, their polyps can completely retract into the surface.